The visual brand seeks out its audience with look and feel. In a voiceless language it describes and informs the buyer with logos, images and color. But information architecture and ergonomics are also requirements of product development. They merge in an artful dance. Kimchee’s popularity is growing world-wide and as Americans discover that there are many types of kimchee they may not want to purchase a full pound of one type. I’ve been working on a personal size retail packaging system. The “Black Label” concept is based on making this variety of fine-aged foods more accessible in 9 oz portions. 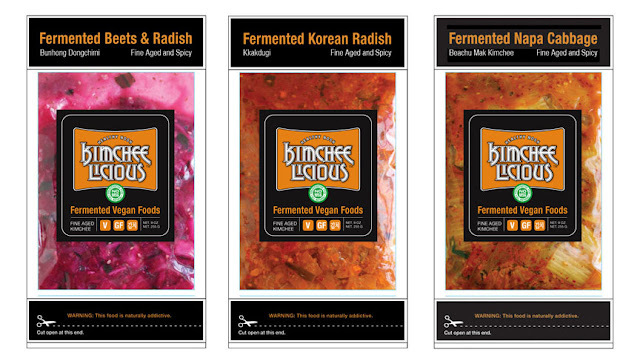 I’ve done months of product stability testing on six types of vegan products, three have risen to the top: Napa Cabbage (beachu mak kimchee), Korean Radish (kkakdugi) and red Beets Radish & Radish (bunhong dongchimi). The next hurdle is product title. How do you get Americans to embrace a Korean name? They sound almost Elvish in nature. It may take time, but over the course of introduction many types of foods have become a part of our food lexicon. These once-new words now almost seem ancient: sake, sushi, miso, Bolognese, pesto, Hollandaise, fromage, Champagne, dimsum, Humus, baba ganoush, falafel... etc. Are Americans ready for a new fine-aged pickle from Brooklyn? I have long road ahead of me but the path to the future is clearly marked. My First Batch of Kombucha!